The World Tour mini-arc is one of the signature parts of Zero Two. It's easy to see why it's so popular. 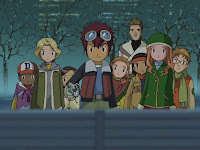 There are hijinks in all sorts of exotic locales, interactions between digidestined that rarely interact, several incidents where hormones override professionalism and a sense of global oneness as kids from four continents join forces. It's hard to bag on it too much. At the same time, these are three episodes each split into two segments that all do the exact same thing with minimal drama and no plot twists. Fun counts for a lot, but this is the home stretch of an adventure anime, not Phineas & Ferb. The American segment alone illustrates the biggest problem: these episodes are so eager to chew scenery and hit the basic cultural notes that they forget to tell an interesting story. It's cute to show Shogungekomon taking a bath under Niagara Falls, but is the U.S. Army really going to just sit there and watch him? This is happening during the Bush Administration; you'd think they'd be blasting that sucker into orbit. Instead, they watch dumbfounded as a girl riding an Airdramon leads him away peacefully. To New York City. Because the best place to round up a nation's worth of wild monsters is Manhattan. Michael makes his obligatory return here as well, along with his dad, the big crazy American who may be an action star in the movies (my Japanese is rusty, but I believe the poster says he starred in a Hiroaki Ishida biopic) but is just weird in real life. His act doesn't fool anybody... except maybe Davis. Even Mimi's dad, who continues his habit of driving motor vehicles into immediate danger, is more goddamn action hero than this guy. While the Cherrymon beating up on the Rockefeller Center Christmas tree is hilarious, the fact that it's the episode's primary action tells you everything. 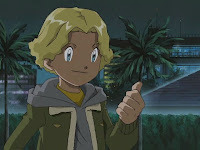 The other American digidestined are nice enough kids, better than Michael at least, although the assortment of minorities to show off America's multiculturalism is just silly. 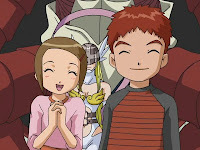 Official texts even went so far as to identify Steve as Jewish and label the girl with the Airdramon as Irish-American. I didn't realize we were still discriminating against the Irish. The Hong Kong segment isn't quite as strange, or at least it won't be once we realize that more than half of the segments involve the international kids crushing on or being crushed on by the Japanese digidestined. It is odd, however, that the dub went with the convention of Izzy trying to over-complicate his explanations rather than sticking with the language barrier in the original. I presume this was done because the Poi Brothers were originally speaking English, but switching that to Chinese would have worked just as well. Even staying in Asia, the lack of geographical awareness was striking once a distress call brings them to the China-India border. First off, that's nowhere near Hong Kong and the gang pops there and back instantly even without Imperialdramon. Secondly, if Izzy can figure out where the China-India border actually is, he will be one step ahead of both China and India. Those countries have never been able to agree on the exact line and history shows that no matter how diplomatic Izzy is, anything involving the China-India border will start an international incident. Plus the Himalayas are prominently involved. Finally, it must be pointed out that last episode, Gennai made a big show of granting the season one Digimon the power to go Ultimate (and Palmon caught up here), yet neither Lillymon nor MegaKabuterimon do anything useful throughout the whole episode. Champions would have sufficed. How exactly were these teams determined? Obviously Mimi's in New York, Davis and Ken had to take the North American spots and TK has a connection in Paris, but did they just draw straws for everything else? Izzy with Kari, Tai with TK and Matt with Ken seem very arbitrary. Wouldn't Matt want to see his grandfather too? One of the “landmarks” of New York featured in a cutaway was the old Giants Stadium... which is actually in New Jersey. It has since been demolished. Mimi's parents are watching a small television in their car while they're stuck in traffic. Did they have those in that size back then? On that note, the crackpot theory about New York being a monster spawning area was a nice touch. Even with the evacuations, are we to believe that New York is really going to be that quiet at night? Guess the city sleeps after all. The silly accents the New York cops used was almost as blatant a stereotype as the outfits of the digidestined from China, India and Vietnam. ...Actually, upon further review, it's the original Adventure that is set in the same year it aired; 02, by extension, is set a year or two after its airdates. ...Wait, we've got something set in December of 2002, in New York City, that actually aired in January of 2001. Which is a short enough distance into the future that it would be pretty brazen not to assume that the New York City skyline wouldn't have changed drastically. Can anyone confirm whether or not they actually showed the Twin Towers? Because that would be absolutely incredible. I know there was a movie that came out in 2000 set a couple of decades in the future that had the Twin Towers having been destroyed, probably in reference to the fact that they were attacked once before, in 1993, but... Man, I really want to know if they showed the NYC skyline and if so, if the Towers were there. (upon seeing the monsters lined up on the border) "Looks like we landed in the middle of a B-movie."